Insulin is the master fat loss hormone. Optimizing insulin production and release means fat loss, energy, satiety and the absence of cravings. Not optimizing insulin means fat storage, difficulty burning fat, fatigue, mood swings, cravings and more. In episode 394 we introduced the insulin index and explained how insulin can be impacted even when blood sugar is not. 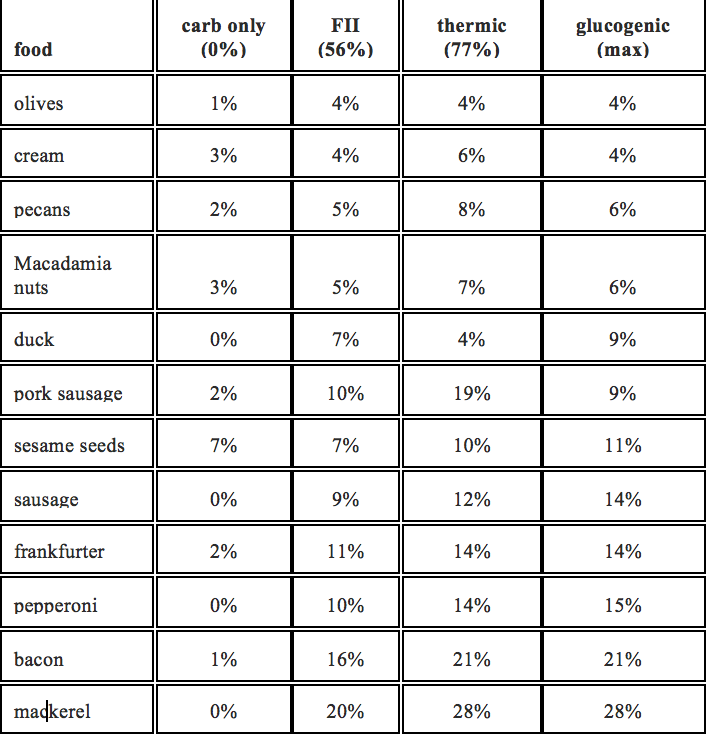 Today we're getting tactical & specific - reviewing which foods might have zero carbs but still produce a measurable insulin response and what you should do about it. Bonus: if you go through thrivemarket.com/primalpotential you'll save an additional 25% & get free shipping on your first order. You'll also get a free 30-day membership! Today we are talking about the insulin index. We talk a lot about the way carbohydrates drive insulin and how our control over insulin really determines our energy, hunger, cravings and ability to burn fat. However, there are many more factors at play than just carbohydrate when we're talking about insulin. In fact, there are some foods that don't have much of an impact on blood sugar but do drive an insulin response. Today is part 1 of a 2 part series where we'll look at all the factors that influence insulin, including some of the tricky ones you wouldn't expect! One of the most destructive ways to hold yourself back & stay stuck in fear and excuses is to believe every thought you think. In today's impromptu episode, I'm sharing a particularly challenging experience I had this past weekend & how it showed me a huge opportunity to stop believing my thoughts. My thoughts were creating fear and making a tough situation nearly impossible. If you find yourself stuck in delay, doubt, excuses and inconsistencies, this will be a powerful episode for you! To join the Fall Fat Loss Fast Track, click here! To watch the Mindset & Motivation Master Class, click here! I absolutely love this episode. A long-time client of mine had a big mindset breakthrough recently & today I'm sharing it with you. For most of her life, this client has indulged almost every day. Chocolate here, ice cream there, she never wanted to miss out on a treat. Even though she wanted to lose weight & get healthy, she didn't want to miss out on indulgences - and that's how she say giving them up - missing out. We talked about a lot of different strategies over many months of work - focusing on what's really worth it & what's not, indulging with less frequency - we tried lots of things. However, her story remained the same: I love treats and I don't want to miss out on them. Recently, she decided to change her story. In today's episode I'm sharing her breakthrough as well as my own perspective shift. If you feel like you're inconsistent and struggle to resist temptation, this episode is for you! If you want to change what you do, you've got to change how you think. In today's episode I'm taking a deep dive into mindset, perspective and the way we choose to make it work for us or against us. We are all coaches. The person we coach most often and most influentially is ourself. Unfortunately, many of us keep calling plays that don't work. In today's episode I'm sharing a coaching call I had with a Fat Loss Fast Track client that's really about about mindset. We talk about lies we tell ourselves, how the little things actually do matter and how you can identify the strategies you keep returning to that simply aren't working. We also talk about the trap of "improvement" and how we can use "improvement" at the expense of "progress"
Lastly, we talk a bit about this week's live mindset masterclass. Don't miss it! Register now and be there live! Next week's Motivation & Consistency Masterclass! It's free! In today's episode I talked about Jackson's Honest Sweet Potato Chips. What's the difference between primal and keto? How do I know if I'm in ketosis? Do I have to be in ketosis to burn fat? We're tackling these questions and a whole lot more in today's episode. In episode 387 I laid the foundation for our week of discussion around ketogenic diets. I defined ketosis, ketones and talked a little bit about "clean keto" versus all those keto plans touting ketogenic treats & desserts. In episode 388 I had the great pleasure of interviewing Mark Sisson (author of The Primal Blueprint) and talking about his newest book, The Keto Reset Diet. Today we're doing a bit of a debrief on those episodes to answer some questions and dive deeper into some of the powerful points we rushed through in episode 388. If you've got questions about fat burning, ketosis or anything we talked about in episodes 387 or 388, don't miss this episode! Reminder: next week I'm hosting a free mindset & motivation masterclass. The more we talk about nutrition & consistency, the more I feel the need to tackle mindset and the ability to create motivation because we can know a lot about nutrition strategy but not have the mental muscle to consistently implement it. The mindset side of change cannot be overlooked. If you struggle with the consistency we talk about in today's episode, make sure you sign up for the free mindset masterclass next week! Ketosis is a state of metabolic efficiency where you are able to burn stored energy in the form of body fat and ketones & not be dependent on regular high carbohydrate meals to sustain your energy, mood and cognitive focus. Ketones are an energy source just like carbs, fat & protein are energy sources. Ketones can be used by your brain, your heart, and your muscles. Ketones are produced by the liver as a byproduct of fat metabolism. Today we have best selling author Mark Sisson on the show. Mark's book The Primal Blueprint was a game changer for me when I was initially adopting a primal way of eating. Today we're talking about his newest book, The Keto Reset Diet and how he thinks that phases of what I'll call "clean keto" are the next level of primal in terms of anti-aging, fat loss, performance, satiety & energy. For an introduction to ketogenic diets, ketones and other general concepts, check out episode 387 of the podcast where I talk about this stuff from a high level to lay the foundation for today's episode. Building a fast metabolism as a health goal is completely flawed. Accelerated metabolic function accelerates again. Guys, it's not that we need faster metabolisms. It's quite the opposite. We need more efficient metabolisms and we can create that with our food choices. He also said, "When I'm keto, I'm barely keto & when I'm not, I'm barely not". Do you know what that is? It's consistency. It's getting to a place where there aren't wild fluctuations in the quality & quantity of your diet. That's what we need to focus on more than an inconsistent extreme approach. I strongly recommend you check out his new book, The Keto Reset Diet & definitely take a listen to today's episode! You can become a better fat burner. If you are overweight, if you have regular cravings or feel like you're hungry all the time, I'd bet that your body isn't very good at burning your stored body fat. In today's episode we're talking about how you train your body to either be carbohydrate dependent or an efficient fat burner. If your body can't efficiently access your stored fat as fuel, you'll have to eat more than someone who can efficiently access & burn fat. Plus, you'll be more hungry & have less energy. We're going to address what ketosis is, what ketones are and how you can begin to train your body to become a better fat burner. This episode will fire you up! We are drawing a line in the sand. If you want change in your life, it's time to change the way you think so you can change the way you act. Change is possible but you've got to decide to do the hard work. Today's the day for change. This episode was inspired by the song Hard Love by NEEDTOBREATHE. If you haven't heard it, take a listen! I've included the lyrics below as well. Don't miss this episode! It's pure fire! Unsweetened, creamy, and delicious, our Cappuccino is an instant classic. Picnik Butter Coffee is made from the highest-quality blend of fair trade organic coffee, grass-fed butter, and MCT oil and packed with 10 grams of grass-fed whey protein. This episode is a must listen! Today I'm talking to one of my Fat Loss Fast Track clients who, as a busy, working mom, has lost 100 lbs in the last year! We tackle how she did it, what she focused on to make it easier, more sustainable & more successful than past dieting attempts and what she's struggling with most. We talk about consistency with workouts, food guilt & assigning emotion to food choices. For those of you who are interested in the LAST Fat Loss Fast Track of 2017, it kicks off on October 1st and I'll be opening up registration exclusively to the wait list on September 14th. Make sure you're on the wait list!! They aren't sure what they really want and they haven't considered which choices give them what they want and which choices don't. Seems obvious, I know, but when you start to ask and answer the questions, you'll be surprised by what you find. In today's episode I'm sharing a conversation with a Fat Loss Fast Track client where we quickly get to the heart of the matter. I ask her what she wants most. She wants to finally feel proud of herself. From there, we dive into what kinds of choices make her feel proud & what choices don't feel proud. When we look at the choices that don't make her feel so proud, we see that she's not using what she wants most as the determining factor in decision making. When she uses that simple question, "Will this make me feel proud", her choices become easier and her results improve dramatically. Reminder: the final Fat Loss Fast Track of 2017 kicks off on Sunday October 1st and registration opens up to the wait list on September 14th! Click here to get on the wait list & learn more about it by listening to episode 352 of the podcast! In today's episode I also talk a bit about Fatco Skincare - I'm not in any way affiliated with the company but I adore their skin care products. I had been buying them from Fatco's site but they're so much cheaper through Thrive Market! I use the Cleansing Oil which is $14.00 on the Fatco site and only 11.49 on Thrive Market! Plus, the Myrrhaculous Face Cream (the other product of theirs I use) is $28 on the Fatco site and $18.29 through Thrive Market!! A few weeks ago I shared a voice note with my Masters Club. I was nervous to share it. I didn't want to offend anyone or make it seem like I think behavior change is easy. I don't think it's easy. But, I do think that we have, as a whole, become self-centered and weak minded. I think, because so many of us haven't personally lived through war, concentration camps, military combat or other intense trials, we've allowed our perspectives to become small. So small, in fact, that we've convinced ourselves that food has more power than we do. So small that we think, though well fed and safe in our homes, resisting a cookie after dinner or abstaining from a third glass of wine is what "hard" looks like. I'm not suggesting it doesn't feel hard. What I'm suggesting is that if that's what hard means to you, we've got to adjust your perspective. In today's episode I'm sharing some things that have really adjusted mine and making some recommendations for those of you who are feeling like change is hard. I hope you enjoy it. I hope you hear it in the spirit I intend it - love and helpfulness.